Your jogging plan depends on your physical health and training goals. 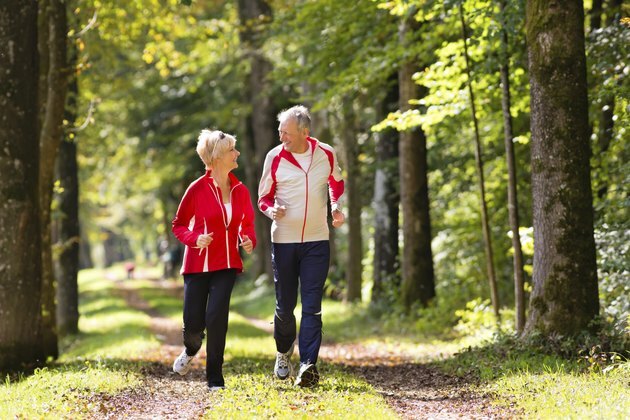 According to the Centers for Disease Control, regular moderate-to-vigorous activity, like jogging, supports your overall physical and mental wellness, while reducing the risk of chronic diseases like stroke, heart disease, colon cancer and osteoporosis. Your daily jogging may change as you develop strength and endurance, but you can start with a routine that works for beginners. Talk to your doctor if you're pregnant, have heart problems or other health concerns. According to the Centers for Disease Control, healthy adults should get 30 minutes of moderate-to-vigorous activity a day on most days in order to ward off chronic disease. Jogging is perfect for this, but if you're new to it, start with 10 minutes every other day and build up to 15, then 20, then 30. You can start jogging daily when your stamina has developed to the point that you won't injure your calves, knees or other body parts. Once you're able to jog 30 minutes a day, still make time for stretching and warm-up and cool-down exercises. To jog off one pound a week, you need to burn an additional 3,500 calories. A 155 pound person burns 446 calories in an hour of jogging -- or a little over an hour a day each week. Because you need a couple days to rest your muscles, make dietary changes to complement jogging. At 185 pounds, you burn 532 calories an hour. You can lose 1 lb. in about 75 minutes with two rest days. If you're training for a race or other physical event -- or just want to avoid boredom -- vary your routine. Fitness consultant Jon Wade at Motley Health recommends that, once you've developed basic strength and stamina, try different routes and terrains. One day might include long-distance jogging from 4 to 12 miles at a moderate pace. The next day, you might try 2 miles at a faster pace. Test out steep or rocky inclines for 2 to 4 miles at paces adjusted for the terrain. Mixing it up daily will keep you strong and challenged. After an injury, you need to tweak your daily jogging routine. The British Columbia Sports Medicine Council recommends that you jog no more than 30 minutes a day every other day and increase gradually by minutes spent jogging -- rather than by speed or distance -- adding no more than 10 percent each week. If pain returns or worsens, stop jogging and talk to your doctor or a trainer about your form and a new routine. How Often Should I Go Jogging to Lose Weight?